You are here : Home \\ Short Sale Articles \\ Emeryville Short Sale in Bridgewater Community Now On The Market! Emeryville Short Sale in Bridgewater Community Now On The Market! We have just listed on the market 6400 Christie Ave #1208 in Emeryville as a short sale. This is a condo located in the highly desirable area community of Emeryville called Bridgewater, which is conveniently located off of Powell St for easy access to Freeways 80 and 580, the Bay Bridge, and the Bay. 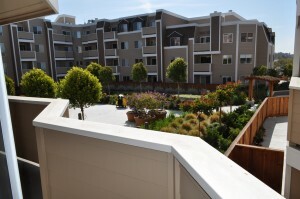 Also close to downtown Emeryville Bay St mall, shopping, restaurants and movie theaters. Bridgewater community has 424 units and is 4 stories high. All units surround a very attractive courtyard setting with lush vegetation and is even pet friendly! The parking garage is gated and secure, and the community also includes a swimming pool, club/rec center, internet access rooms, and much more! These condo units were built in 1988 and have been nicely kept up. This particular short sale unit in Emeryville is 685 square feet, has 1 bedroom and 1 bath, and has a patio that overlooks the beautiful courtyard. Also included is 1 designated parking space below the building in the secure parking area. Home is in good condition and will just require a deep cleaning. This is a pre-approved HAFA short sale with Bank of America, with the seller just having one loan. The price of this Emeryville short sale is listed at $190,000 but could potentially fetch bids well above this amount. But the minimum that the bank must receive is $190,000. Bank of America HAFA provides for a seller relocation of $3,000 and can even potentially pay more, even money to the tenant if it is an investment property. For showing information for this unit please contact us, or if you are already working with a realtor have them look at the MLS for showing instructions. If you would like more info on how we can do a short sale of your home let us know. We have closed over 100 short sales and are experienced with all lenders, and service all cities in Alameda and Contra Costa County! Previous post: Emeryville short sale successfully closed! Navigation: Weblog / Blog article: Emeryville Short Sale in Bridgewater Community Now On The Market!